Before there were Google maps and GPS, there were Atlases. I remember as a child scouring over villages and towns; examining how cities oozed into suburbs and suburbs succumbed to forests, rivers and lakes. Highways and secondary roads connected everything much like the veins of the human anatomy only instead ensuring the steady flow of traffic throughout the country. Unlike the obligatory “Are we there yet?” of my peers, I was more than happy to enjoy the journey; the car and its rear window my world. 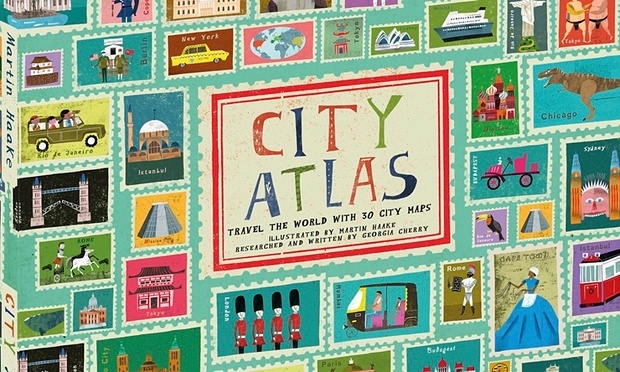 City Atlas is a fantastic read for beginning and seasoned geographers young and old. 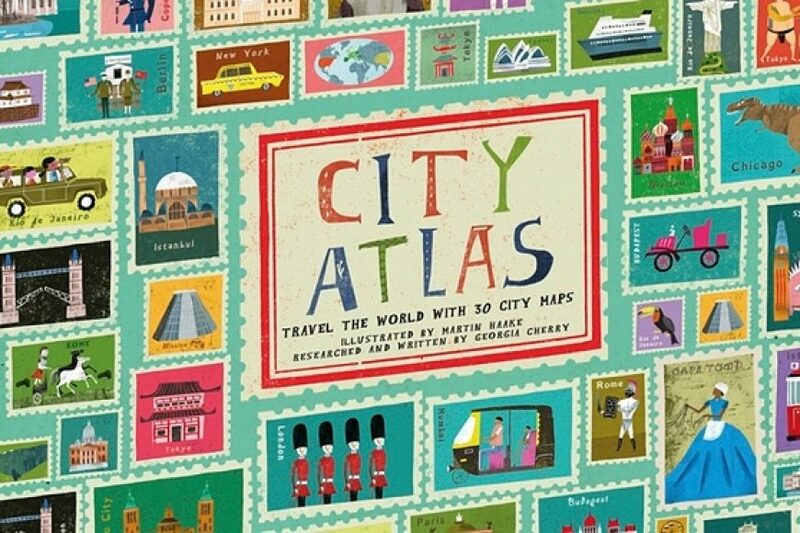 Each page has a beloved city from across the globe. On the first day we read it, I had my kids choose where we should go. We hit up Mumbai, San Francisco and in celebration of the upcoming Olympic Games, Rio de Janeiro all before lunch. Every page is beautifully illustrated to incorporate well-known landmarks, cultural traditions, local food specific to the area and fast facts. As an added bonus there is a picture search on every page. I particularly enjoyed looking for koala bears in Sydney. The illustrations are wonderful; consistently eye-catching and intricately collaged across the page. The colors of each city seemed to be flawlessly aligned with the colors of the country and culture. Mumbai, for example was bursting with myriad colors; Gandhi is drawn wearing lettered garb and a strikingly beautiful elephant God is drawn slightly off center. It is an absolute feast for the eyes. I also enjoyed that the geographical landscape was the original layer and all of the landmarks are placed throughout the city; a man –made topography. You almost feel as though you yourself are sauntering through the cities. So for those budding Rick Steves out there intent on globetrotting, get a head start by navigating these cities from the comfort of your couch- no passport and TSA frisking required!